Awoke to the great sound of rain ... great because we are abit behind and the garden and yard is in need of water. Let it rain !!! Dressed for the gym in case it was going to be a bust, and once I got out there, discovered that most figured it was going to be the major rain projected and the yard sales were cancelled or delayed to later in the day. Made a stop at one, and headed off to the gym ... I'm in serious need of the exercise anyway. 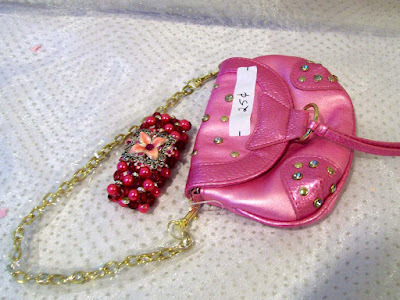 A little Girls purse ... which I purchased for the chain handle & clasps. About the purse ... it's brand new ... the price tag was removed but the little price strap is still thereand the chain has the plastic wrapping to protect it. I find it surprising how often I find items in yard sales that have never been used .... I guess some folks just shop and shop and when they run out of room (or credit), have a yardsale. I'll remove & keep the chain/clasps, attach a piece of ribbon for a handlle and drop this in the Grans Thirft Shop Bag. Some little girl will still love this little purse.